IBEW Local 110 members (L to R) Jaime Hubbard, Dan Crawmer and Ray Lee called out Bonfe’s for not paying area-standard wages and benefits to its electricians. Bonfe’s Plumbing, Heating and Air Service held an open house for prospective employees last night in St. Paul, but not everyone on the guest list appreciated the invite. 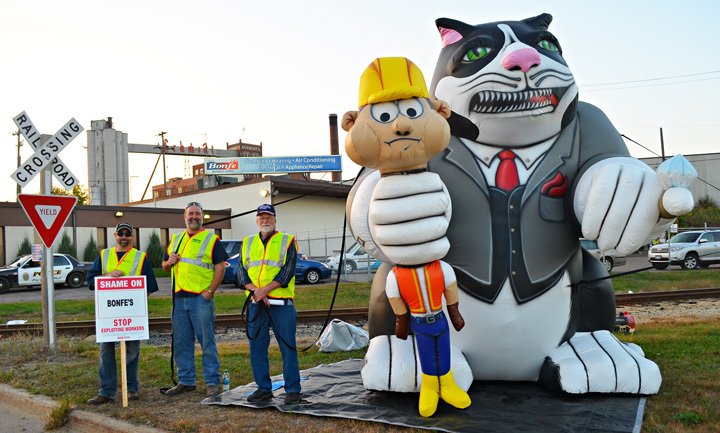 About two dozen members of St. Paul-based Local 110 of the International Brotherhood of Electrical Workers surrounded Bonfe’s property during the open house. They carried signs and banners, distributed leaflets and warned the public – and potential employees – that Bonfe’s does not pay its electricians wages and benefits that meet area standards. 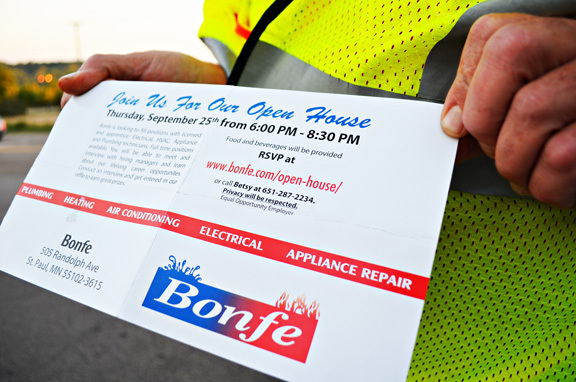 Bonfe’s, a non-union contractor, mailed open-house invitations to members of IBEW Local 110 in an apparent attempt to “poach” skilled workers. The open house drew IBEW Local 110’s attention after members reported receiving invitations in the mail, union representative Jeff Anderson said. Anderson speculated that Bonfe’s accessed Local 110 members’ mailing addresses via the Minnesota Department of Labor and Industry’s registry. The open house, he said, was nothing more than an attempt to “poach” skilled workers from the IBEW and its signatory contractors. Bonfe’s once was among Local 110’s signatory contractors, but it decertified about five years ago. The company no longer hires union electricians, plumbers or sheet metal workers. Bonfe’s is completely non-union.